'Both a saga of tragedies and a detective story... 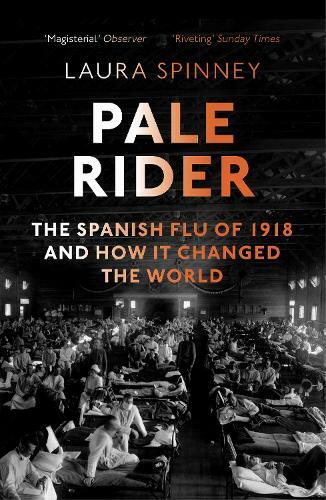 Pale Rider is not just an excavation but a reimagining of the past' Guardian With a death toll of between 50 and 100 million people and a global reach, the Spanish flu of 1918-1920 was the greatest human disaster, not only of the twentieth century, but possibly in all of recorded history. And yet, in our popular conception it exists largely as a footnote to World War I. In Pale Rider, Laura Spinney recounts the story of an overlooked pandemic, tracing it from Alaska to Brazil, from Persia to Spain, and from South Africa to Odessa. She shows how the pandemic was shaped by the interaction of a virus and the humans it encountered; and how this devastating natural experiment put both the ingenuity and the vulnerability of humans to the test. Laura Spinney demonstrates that the Spanish flu was as significant - if not more so - as two world wars in shaping the modern world; in disrupting, and often permanently altering, global politics, race relations, family structures, and thinking across medicine, religion and the arts. Fascinating and yet frightening. Read the book twice. I'm first in line for the flu jab this coming winter.